Do an image search for the word ‘hipster’ and what you’ll find is photographs of men who all look a little bit the same. Most will have beards, lots will be wearing glasses, and there’ll be a few hats and the odd bow-tie in there, too. But the single most common factor you’ll see before you is the flannel shirt. Ever since this clan of men became a thing, flannel shirts have found themselves tangled up in the stereotype. However, it’s worth looking beyond the connotations of artisan coffee-drinking lumbersexuals, because this garment is, in fact, an unsung menswear classic – a hardy wardrobe workhorse and the definition of a winter shirt. Hamilton Carhartt is often credited with popularising the flannel shirt in the US. Founding his eponymous company in 1889, he made clothes for the American working classes, and today that style has been appropriated by trendy and occasionally-bearded millennials. The most famous pattern associated with the flannel shirt is the buffalo check. This bold red and black design originated around 1850 and was produced by Woolrich Woolen Mills. This the classic lumberjack-style shirt which has become synonymous with the forests of North America. The popularity of plaid flannel shirts rocketed during the 1990s thanks to grunge and bands such as Nirvana and Pearl Jam. Today, designer names like Givenchy and Saint Laurent, as well as high-street staples like Urban Outfitters, are using these references to make the checked flannel shirt a timeless item of menswear. However, it is possible to shun checks altogether, either sticking to block neutral colours like grey and navy or by introducing bolder shades like bottle green, rust or burgundy. There’s more than one way to wear them, too. Wayne Sørensen, founder of workwear-inspired menswear label Sørensen suggests wearing promoting it from being a mid-layer. “Push them as an overshirt [and wear them with] a contrast plain T-shirt [or sweatshirt] underneath. The American workwear brand is one that still sells flannel shirts to actual labourers, who continue to buy them because they’re designed to shield against the elements. Expect thick cottons, generous pockets and triple-stitched seams that are built to endure an outdoor lifestyle, even if you’re not. As well as practical work shirts and sherpa-lined overshirts, you’ll also find more muted options for the brand’s loyal streetwear following. The high street behemoth was born in Scandinavia, where they know a thing or two about staying warm in practical outdoor clothing. 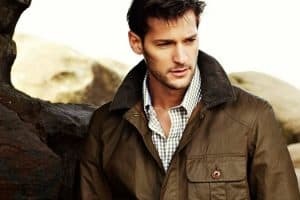 But it’s not all rugged practicality at this end of the market: fashion-friendly designs, tapered fits and design touches like concealed button-down collars make for a versatile (and affordable) addition to your wardrobe. Launched in 2016, Sørensen, founded by ex-Orlebar Brown design director Wayne Sørensen, is redefining luxurious basics for men. The label fuses modern manufacturing techniques and historic workwear references with typically Scandi results. Sørensen’s flannel shirts are updated with drawstring waists in solid colours and matching buttons. Perfect if your style is clean and stripped back. Fat Face began life in 1988 when two guys enjoying life on the slopes hatched a plan to print sweatshirts and T-shirts, sell them at night, and ski during the day. With that simple formula, the retailer was born, even taking its name from the pair’s favourite black mountain run in Val d’Isère, La Face. Three decades on, the business is well known for its range of affordable sports, lifestyle clothing, with affordable flannel shirts being a stalwart. Family-owned business Portuguese Flannel continues to turn out quality menswear staples from the home town of founders, António and Manuel Magalhães, in the northern most tip of the country. The brand source exclusive fabrics for its shirts, which are put together by master craftsmen. Inspiration comes from the coast and mountains of Portugal, with a range that’s strong on muted colours and simple shapes. Since 2002, British brand Folk has pioneered contemporary workwear. Its Flannel Pop Stud shirt is cut from 100 per cent cotton flannel sourced from Portugal and finished with a snap front closure using Japanese matte plastic studs. Instead of a traditional pocket, Folk has used its special ‘deboss’ technique to give the clever illusion of a chest pocket. Founded in 2005, contemporary Swedish brand Our Legacy has quickly become a hallmark of masculine Scandi style. Its current collection of flannel shirts are made from 100 per cent cotton in a boxy fit with mother of pearl buttons and offer the considered minimalism expected from this label. Tom Joule began selling clothes at outdoor events throughout the UK over 25 years ago. Today, Joules offers classic British menswear updated to look contemporary while staying resolutely wearable. The ‘Barbrook’ classic-fit shirt in navy flannel is a favourite of the countryside crowd, with its button-down Oxford collar and double breast pockets that sit happily under a tweed blazer. Everybody’s favourite basics store, Uniqlo’s flannel shirts are, as always, affordable, and the choice plentiful. Plain Oxford styles come in a multitude of colours, including deep grungey checks that channel your inner Cobain. All to be had in 100 per cent cotton with enough change from a note to get a complementary flat white. Think Superdry, and you probably think bold checked shirts in heavy flannel. And you’d be right. The brand’s sturdy milled flannel comes in a neutral grey and white check with twin chest pockets, quilted shoulder panels and lumberjack elbow patches. It’s one that looks just as good unbuttoned over a T-shirt as done up with raw denim. Saint Laurent’s latest head designer, Anthony Vaccarello, is continuing the legacy left by his predecessor Hedi Slimane. Skinny rock stars with big hats and pointy shoes are the target market and Western flannel shirts in ombré checks in this grungey aesthetic have become a signature for the brand. Born for the great outdoors, Pennsylvania-based Woolrich knows a thing or two about flannel, with a history of producing outerwear that’s both stylish and practical. Current options include plain Oxfords, handsome house checks and a ‘Cavallery’ shirt jacket that typifies the perfect shacket with practical front pockets.